Drivers in the market for a new minivan have a variety of excellent options to choose from, but one vehicle that stands out among top competitors is the 2017 Honda Odyssey. The 2017 Odyssey offers drivers a long list of standard safety features, a variety of trim levels and a generous amount of interior space. The 2017 Odyssey comes in six trim levels, and all trims come standard with a 3.4-liter V6 engine that produces 248 horsepower and 250 pound-feet of torque. The engine is paired with a 6-speed automatic transmission. Ready to learn more? Read on for an in-depth look at the 2017 Odyssey’s features and specs. The 2017 Honda Odyssey comes in six trim levels, allowing drivers to choose which trim best fits their needs and preferences. Trim levels include: LX, EX, SE, EX-L, Touring and Touring Elite. Each trim also comes in a variety of exterior color options. The 2017 Honda Odyssey has room for everyone and everything you need to bring with you to get where you’re going. With seating for up to eight and 172.6 cubic feet of available passenger volume, you can rest assured space won’t be cramped. There are plenty of advanced safety features available on the 2017 Honda Odyssey including: Honda LaneWatch™, the Blind Spot Information System, a rearview camera with guidelines, Forward Collision Warning and Lane Departure Warning. 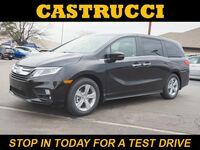 Car shoppers looking for more information about the 2017 Honda Odyssey are encouraged to contact a member of our team at Matt Castrucci Honda. Drivers ready to get behind the wheel of this great minivan are encouraged to schedule an obligation-free test drive online or stop in and see us at our location in Dayton. 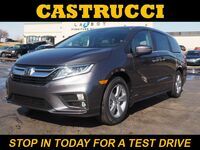 Interested in a 2017 Honda Odyssey?